the end of co-operative federalism? All content is copyright the respective authors. No responsibility is taken for any of the comments. The judgement is that Treasurer Joe Hockey's first budget is harsh for lower and middle income earners and unfair as they bear the brunt of permanent spending cuts whilst the wealthy are subjected to a temporary lift in income tax. The young bear the brunt of some of the harshest cuts whilst the miners have their tax lifted. Is it any wonder that the backlash about the budget hit on those who can least afford it continues to grow, despite acceptance of the need for structural budget repair? It is also predictable that the Coalition and non-media and News Ltd media allies would turn on the budget's critics. It was no surprise that Abbott + Co would play a game of bluff about calling a double dissolution election if the senate blocked too much of Hockey's budget, whilst promising second term tax cuts. It is as predictable as the Coalition locking the country into a fossil fuel future despite the current depressed coal prices, low profits and the structural decline in the demand for coal. The negative reaction to the Coalition's 2014 Budget is to its neo-liberal mode of governance under the guise of having the courage to stand firm to save Australia from Labor's Debt and Deficit Disaster. It is realized that this mode of governance is taking steps away from a Howard-style conservatism towards the free market individualist governance of the United States. Presumably, this is being done in order to achieve higher rates of economic growth by supercharging the economy. In this type of society corporate profit comes at the expense of the environment and the most vulnerable members of society. Therein lies the political poison, and the Weatherall Government in SA will make good use of it as the budget and economy crumbling around them. Their own slash-and-burn budget to cope with the changed budget picture will be sheeted home to the federal cuts to the states made by the Abbott Coalition. It is all a bit needlessly, cruel and hypocritical, so it is good to find not all Australians are brain dead to the point where not even a twitch registers when this sort of policy making turns up. But how were Australians so STUPID as to vote them in in the first place? "how were Australians so STUPID as to vote them in in the first place"
They voted to dump a dysfunctional Labor Government at war with itself. According to neo-liberals we should celebrate businesspeople for their achievement in accumulating large amounts of money and ignore the social or environmental cost. The Abbott Government's cuts to the financial assistance grants to local government (by freezing indexation) means that local governments will have to raise rates, increase grant funding from other sources or get rid of staff due to budget cuts. the effect of Abbott’s scheme to deregulate university fees and allow the market to set the price is to create elite institutions for children of the wealthy and to frighten away others who might have once used higher education as a leg-up. "The young bear the brunt of some of the harshest cuts whilst the miners have their tax lifted." The assumption is that young Aussie adults are that lazy and lacking in aspiration. There is no shortage of jobs, just a shortage of effort that a bit of stick will soon fix. 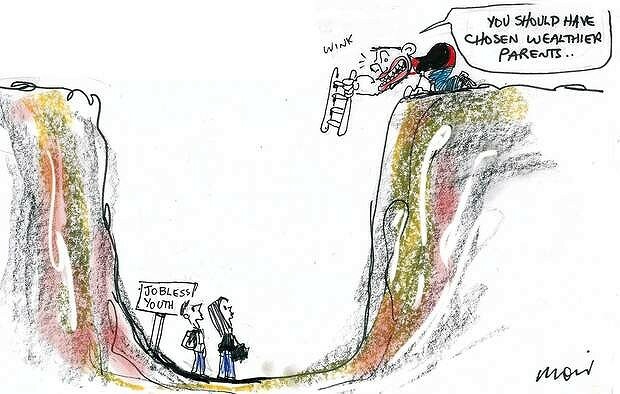 young people are happy to live on the dole forever according to the Coalition. That's why they need to be punished. The so-called need for budget repair is entirely a deliberately confected myth coming the extreme right wing of our society and enunciated by the proponents of greed and selfishness. The Guardian has an informative interactive device where by clicking on a preferred option you can [but Hockey and the COALition apparently are unable to] fix the alleged problem dead easy with no pain. The COALition attacks on those who do not fit into their favoured people class are entirely motivated, absolutely entirely, by nasty blind. Why not go to the Guardian and see how easy it would be to fix the purported 'problem without hurting the weak and vulnerable?